We’ve had our audio recorders running during a good chunk of our journey. You can hear more audio collages here. 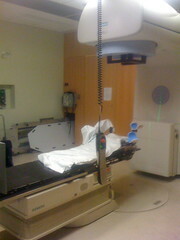 Andrea brought her audio recorder along to one of her radiation treatments and captured her experience. Join Andrea, virtually, as she’s greeted, positioned and treated. Her “director’s commentary” makes it possible to understand what’s going on. Click here to subscribe to our blog/podcast. Prior to this journey, I had a long-standing, comfortable, mutually supportive, fun, close relationship with exactly one member of my family. not to mention Mark’s cousins, aunts and uncles. During the first five months of this journey, long lost cousins Tracy, Kathi, Betti and Stephanie have found and chosen to follow this blog and have offered hints at new beginnings and good vibes. One very special cousin, Kelly, has become a pillar of emotional support, providing frequent and dependable doses of cheerleading, wisdom, humour and good company. She has become a huge part of our little family. And without a single physical meeting or even a phone call, my long lost Aunt Barbara has become as much an aunt to my own girls as they have ever known. This burgeoning renewal of faded childhood connections has been nurturing, healing, educational and warm. And I am immensely grateful. Yet even the failures at reconnection have been educational. Some of the most intriguing and thought-provoking phenomenon have been the reverberations — both positive and negative — of my diagnosis on the most painful, ever-present histories, lurking hurts, disconnections, uncommunicated expectations and disappointments of the relationships with 7 of our direct family members. Perhaps you’ve seen similar patterns in your own experiences? It’s a long conversation but it’s important for us to share it. We hope you will give it a listen and that you’ll grant us the privilege of your thoughts, below. Being decisive is hard, especially when new information causes you to constantly revisit, rethink and even reverse your decisions. That’s par for the course when you’re dealing with something like cancer-related surgery. We’ve had our audio recorders running during a good chunk of our journey. This includes conversations and telephone calls as we considered which of either a lumpectomy or bilateral mastectomy was the best course of action. It was interesting distilling three hours of recorded conversations to this 10 minute story, and particularly surprising to think this process dates back three months already (this audio was recorded leading up to Andrea’s first surgery, October 26, 2009). 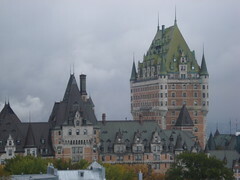 Two days after Andrea was diagnosed with breast cancer, we took the train for a much needed four day vacation in Quebec City. It was Canadian Thanksgiving weekend. Listen in as Lucy and Bayla order our lunch in French, we share what we’re thankful for and the sounds of street musicians in the heart of Quebec City. It was 3 a.m. on the second day of her first chemo cycle and Andrea still couldn’t get to sleep. So she occupied herself with plans for shaving her head before her hair falls out — a certainty with breast cancer chemo. That’s when she pitched her idea to me (I was also awake). Inspired by a cancer blogger who lives in our neighbourhood (See going bald), Andrea suggested we invite a number of our family and friends over for munchies, drinks, cake and the opportunity to be a part of her head shaving experience. That party happened last night (view photos). And with it, comes the launch of this website, WeCanRebuildHer.com. We invite you to follow our journey to making Andrea a breast cancer survivor. We’ll blog our experiences and thoughts and share audio, video and photographs of the process — from diagnosis on Oct. 6 to Survivor. Opening theme prepared by John Meadows. Closing song, Session, by the Robert Farrell Band.